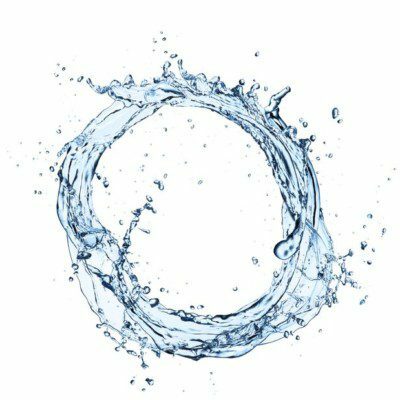 What are Water Blending Systems? Adjust the temperature of water as an ingredient to send to mixers and liquid fermentation tanks. Precisely metering and dosing of water for flour hydration. Process liquids with a superior hygienic design equipment (304 stainless steel tubing, clamps for pipe connections and joints, and 316 stainless steel control valves). Water blending systems are currently gaining a lot of attention in the snack and bakery industry. High speed bakery operations handling large amounts of raw materials and using bulk ingredient handling systems require accuracy and consistency in liquid ingredients metering and strict control over dosing temperature. A water blending system can come with a configuration that allows bakers to combine 2 or 3 water streams to produce a single water output at a preset temperature and/or flow rate. In this system, one of the 2 or 3 streams (pipe sections) is regular water that may come from the city’s water supply (this water stream is not heated or chilled). The other streams, depending on the blending system, can be hot and/or chilled water. Block diagram of feedback controlled closed loop system. Depending on the desired temperature of output stream (set by the bakery based on process needs), the water blending system determines whether it will blend the city water with the hot or cold stream. 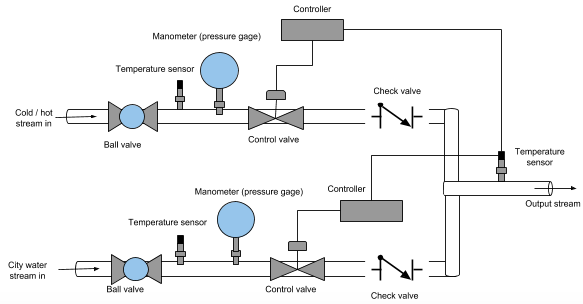 The control system uses the blended water (output stream) temperature to determine where to (and to what extent) adjust the individual stream’s control valves. A control panel with touch screen (HMI) for temperature and volume selection is usually used to control the blending valves. Simplified representation of a 2-stream water blender. Stainless steel used for piping, instrumentation and accessories. Stainless steel (SS) is a family of chromium (Cr) containing alloys with a minimum Cr content of 11–12%. The water blending system uses SS 300 series, more specifically AISI SS 304 for piping and AISI SS 316 for valves. Excellent corrosion resistance (improved by incorporating molybdenum, Mo). Excellent weldability, particularly the L (low carbon) grades. Surface with a mean roughness (Ra) of 0.5 μm. Smooth surface finish helps improve line cleanability (proper pump and line installation is needed to guarantee cleanability throughout the blender line. Type 304 has a composition of 18–20% Cr, 8–12% nickel, 0.08% maximum carbon, 2% maximum manganese, and 1% maximum silicon. Grade 316 has a similar composition except that the Cr is reduced to 16–18%, and 2–3% Mo is added. The main limitation of 300 SS series in the food industry is that these grades are susceptible to halides, particularly chloride ion attack resulting in pitting. It is recommended to keep low chloride levels (up to 50 mg/L or ppm) during cleaning and sanitizing cycles. Bhuyan, M. “Measuring and Controlling Devices.” Measurement and Control in Food Processing, CRC Press, Taylor & Francis Group, LLC, 2007, pp. 27–103. Singh, R.P. “Heat Transfer in Food Processing.” Introduction to Food Engineering, 4th edition, Academic Press, Elsevier Inc., 2009, pp. 247–260. Murray, A.N. “Hygienic Design of Equipment.” Encyclopedia of Food Safety, Volume 4, Academic Press, Elsevier Inc., 2014, pp. 181–188. Having Problems Commercializing Your Food Product?